"Dance is a language with a power to encourage the spirit, evoke memory and reflect ideas. In our work we construct dance, imagery and music that reflects on living, life, people, or on qualities of movement which - in and of themselves - take our imaginations to those places. Dance, and dancers, are perhaps one of the last remarkable vestiges of living in the moment-of working in ways that don't necessarily compute-of working with one's body and imagination, and ultimately with each other.a rigorous place where we rely on the body's wisdom to respond in new ways to what it already knows or to what the mind reflects upon. There are many ways into that centre.it's a hard life, but a magnificent world." Robert Connor & Loretta Yurick create multidisciplinary work for theatre and a diverse range of settings that is “a constant reflection on our human states of frailty and strength” (Buckley,Sunday Times, London). They have been instrumental in the development of contemporary dance in Ireland throughout their careers as performers, choreographers, teachers and producers. 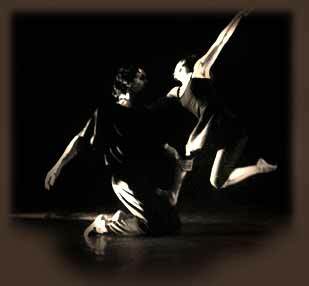 They are founders, principal choreographers and Artistic Directors of Dance Theatre of Ireland (1989) and have created over 30 original dance theatre works, most utilising original music and design with some of Ireland’s finest artists, including Robert Ballagh, Nigel Rolfe, writer Brian Keenan and musician Pól Brennan (Clannad), among others. Their Theatre work (As A Matter of Fact, Watermark, Exodus, PRISM) has incorporated Digital Technologies and video, including motion capture & 3-D Digital animation. Their outdoor work Block Party! created with 5 dancers, 3 drummers and 32 gigantic blocks, has toured 3 continents and continues to tour. Their work has been presented at many international Festivals: The Seoul Performing Arts Festival, Monaco Dance Forum, London’s Greenwich Docklands, Montpelier Danse Festival, Tanzwochen Dresden, CYnetART, Fira Tarrega, Joyce Soho (New York) Ordway Centre for the Performing Arts (MN) and has toured to major venues in Korea, Italy, France, Sweden, Netherlands, Germany, UK, England, Spain, the USA and to the major theatres in Ireland and Northern Ireland. More recently they have collaborated with SOUL STEPS (USA) creating the foot stomping, body-clapping Every Little Step...the Rhythm of Hope featuring African-American and Irish dance, rhythm and culture. Dance Theatre of Ireland have also collaborated with and commissioned the work of seminal international choreographers including Dominique Bagouet, Martine Pisani, Charles Cre Ange, (FR) Rui Horta (Portugal) Joanne Leighton (BE) Charles Linehan & Janet Smith (UK) Philippe Saire (CH) Blok & Steel (NL)and Jerry Pearson(US). With Dublin Contemporary Dance Theatre they have worked with Mark Taylor, Marta Renzi, Nina Martin, Yoshiko Chuma and Art Bridgeman/Mryna Packer (USA). Robert and Loretta are also very experienced educators, Founders of the Centre for Dance in Dun Laoghaire and progenitors and principal instructors of Ireland’s largest Educational Dance Outreach programme, DANCE POP (Dance Performance Outreach Programme). Since its inception in 1990 with the support of the Ireland Funds, over 70,000 children, young people and adults have participated in dance workshops, ranging from once-off experiences to residencies that culminate with informal performances. Their educational work has been in both primary and secondary schools, as well as with teacher training colleges with 3rd level students and seniors. Through the Pushkin Trust they have taught workshops for teachers, student teachers and teaching professors. They have led collaborative creation projects and have coordinated flash-mob events for local youth service groups. They have recently presented at St. James’s Hospital/ActivAge 2013 Conference on the benefits of dancing for Seniors. They teach contemporary dance, technique, improvisation for children (ages 3-8), adults, teens and Seniors; Recently they have created NATURE MOVES – a new educational outreach programme combining dance and outdoor experiences, using nature as inspiration in creating dance works; They have taught on a range of Summer courses for all ages working with national organizations, Festivals and Arts offices in Kilkenny, Mayo, Wicklow, Galway, Cork and Dublin. Robert and Loretta are co-founders of Dublin Youth Dance Company (DYDC) and serve on the Board of Directors. An outgrowth of DTI’s Educational Outreach, DYDC was founded to provide young people with professionally directed ongoing training and experience in creating and performing dance. They hold BAs in Psychology and Urban Studies, respectively. Robert & Loretta are founders and for 10 years, former Officers of the Association of Professional Choreographers & Dancers in Ireland (now Dance Ireland).